This easy guide to purple wedding flowers shows you what flowers are available and also offers some tips on colour combinations. 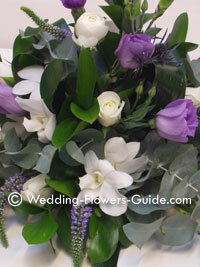 One of our favourite purple wedding flowers is Lisianthus (Eustoma). This is a beautiful bell-shaped flower when in full bloom (see photo on left). It also has an appealing colour and interesting spiral pattern when in bud. These buds can make great boutonnieres (buttonholes). Lisianthus comes in a variety of colours. Purple varieties include 'kyoto purple' and can work well together with white lisianthus and other larger focal flowers. The exotic orchid Vanda, has a wonderful variety with a purple and white chequered appearance (photo above right). It is a flower that everybody I have spoken to seems to love. It is also quite unusual; you rarely see it on general sale in florists and certainly not in supermarkets. This can make it a great choice if you want to combine sophisticated elegance with a touch of exclusivity. 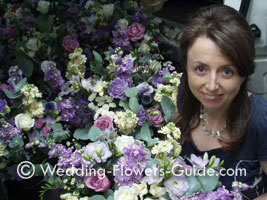 Watch the video below to see some of the purple wedding arrangements that we have created. There are a number of freesias within the violet/purple colour range. These delicate flowers are ever popular, as much for their fragrance as their looks. Gladioli can be placed in venue arrangements to make a striking statement. Purple varieties include 'Purple Flora'. If you can get the flowers at their peak time of opening, a vase of several stems of Gladioli can look spectacular with very little else. Tulips give you a choice of varieties that make superb purple wedding flowers. 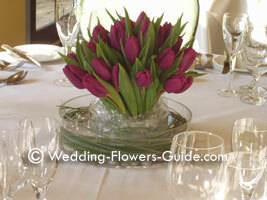 I made the tulip table decoration above for a wedding reception at Ansty Hall, Coventry. You should be able to obtain them from winter through to summer. These flowers work well in the bridal bouquet and can be continued through to ceremony arrangements and table centrepieces to give a themed look. 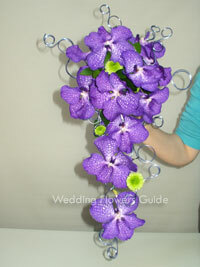 Stocks is a traditional flower that has lilac/purple varieties. It works well in vintage style weddings. Below is photo of me loading up the van with this flower to deliver to a wedding. The darker purple flowers can sometimes need a 'lift' in their colour scheme by combining them with brighter coloured flowers. A colour combination that we have used successfully is dark purple combined with lime green and white flowers. Another good colour combination for purple wedding flowers is the complementary colour scheme of purple and yellow.